Sorry I am late today. Thanks to my great friends at Verizon Frontier for making sure that the standard crappy internet service we get was extra-crappy today! Noted political guru and 2020 Candidate, Kayne West, announced that “if he had voted, it would have been for Trump.” As the crowd in San Jose booed, he explained that it was not because he supports anything he believes Trump supports, but because by supporting Trump as an African-American, he was could feel persecuted. Now he feels “vindicated.” Even though he didn’t actually vote for Trump. And there are spurious and unconfirmed reports that he and his mega-wife Kardasshian are leaving the country. I don’t believe them because they travel so much anyway. Let’s be absolutely clear about this, while there is much discussion that can be had about both undocumented illegal immigration and PLRI refugee influx, the idea that ejecting anyone – ANYONE – is “supported” by the Supreme Courts ruling in Korematsu is ridiculous. While one could argue that the ruling still stands because it has not been reversed by the Court or overturned by Congress, there is no Court in the land that would buy that argument today. And before you go off and blame Trump for this one misguided individuals understanding of the law and the 14th Amendment, recall that it wasn’t that long ago that another Candidate for President explained to us that Dred Scott was still “the law of the land” because the Court had never reversed itself on that one either. Idiot. Thirty-two years ago today two things happened that impacted my life forever. Around 1300, during a drill, I managed to ram my right knee into the Third Level Ops/MC Hatch. That little odyssey finally ended with the replacement of my knee this year. 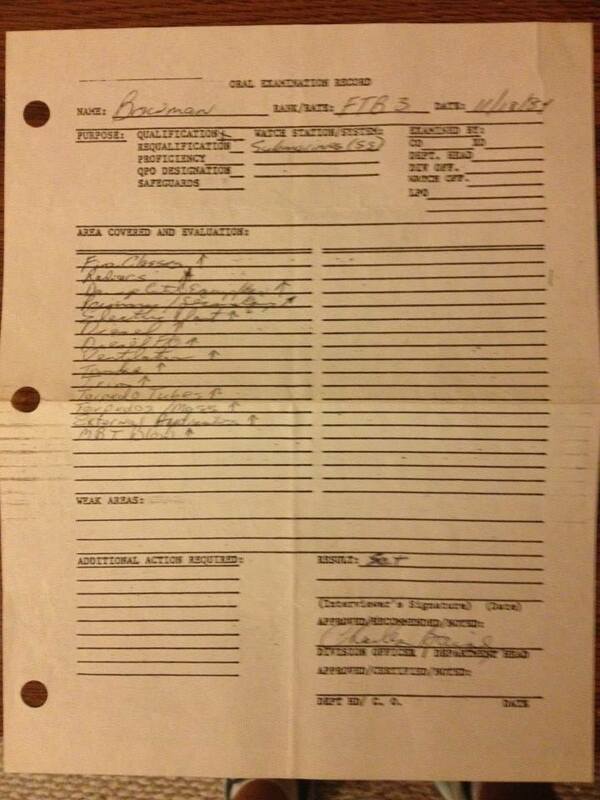 Later that evening, I passed my Submarine Qualification Board. Becoming a US Navy Submariner was the greatest job I have ever had, except for raising Ben. I loved it and I don’t say this lightly, it is what I was born to do. I would gladly have given up a lot more than my knee to be a part of the crew of USS Michigan. A special thank you to all of my shipmates and friends who were there to go through that process with me, especially Mitch Yzaca, who taught me to be a submariner and a Fire Controlman. I have talked, albeit briefly, about the Haber-Bosch Process, which takes nitrogen from the air, and fixes it so that it can be used in the ground as fertilizer. This has allowed modern farming to feed the world. By some estimates, without the process, we could only feed about half the world today. In other words, the lack of the process before 1910 was in effect, a self-limiting governor of the population of the Earth. We simply could not feed more than 3-4 Billion people, which means that much of a population such as we have today would starve. The Haber-Bosch process was not a huge miracle, the German firm BASF and others had been attempting it since the late 1890’s when it was realized that Great Britain would be able to blockade Germany in the event of war, thus depriving her of the import of nitrates from Chile*. This caused enough concern about feeding her people that there was a good deal of experimentation and arguments over who actually developed the process first. BASF was sued in 1911 by a rival company claiming that their patents were invalid because another Nobel winning scientists had done the original work which Haber then turned into the final process. They lost the case when the first scientist wrote a very nice letter complimenting and congratulating Haber on his work and then walked into the trial with Haber. When World War I broke out, German imports of nitrates ceased, and she was forced to use the process to manufacture munitions rather than grow food. Some historians have computed that the war should have ended in late 1916 or early 1917 based on the available supplies of nitrates, but because she was able to produce them in Germany rather than import them, the war continued until starvation and revolt put a stop to the slaughter. Well… first off I am finishing up my reading of the book, “The Alchemy of Air,” which is the story of the process and its effect on world history. I highly recommend the book, and I would be remiss if I failed to mention that it was David Nabhan who in turn recommended it to me during a discussion of Global Warming, CO2 and the effect on food production. Then yesterday I came across them gem of an article: Will Genetic Engineering Be Necessary for Humans to Survive Climate Change? The idea of genetically engineering humans has almost always been universally panned as a bad idea. Whether its selective breeding to create a super master race; a Peoples Demokratick Republick trying to win a few more Olympic medals; to the idea that you might be able to pick your unborn child’s hair color or prevent some susceptibility to a horrible and feared disease, the idea of trying to manipulate evolution and adaptation has always caused people to be repulsed. It’s also the stuff of legends in SciFi, from Star Trek (KAAAAAHHHHHHHNNNNN!!!!!) to Gattaca. The climate has changed before. Many, many, many, many, many times. Twenty-five thousand years ago, the place where I am sitting right now was under a mile of ice. The climate changed, and now it isn’t. In fact, now it’s the best farmland in the world. In 1200bce, the climate changed and empires were crushed as humanity moved all over the place. Throughout the four billion year history of Earth (or 6000 years**), the climate has changed to and fro, allowing giant insects when O2 was richer than it is today and more green plants when CO2 was higher than it is today. Cold, hot, iced, warmed, the only consistent thing about Earths climate is… well… change. And through it all, life has always adapted and changed with it. Those life forms which could not adapt, died out. That’s evolution. Darwinian survival of the fittest. Passing on the means to survive. Now, if man is an evolutionary life form (and for the record, I accept that he is), then the crowning ability he has evolved is that he is the only life form that is consistently able to change the environment in which he lives. Whether it’s changing the flow of rivers for better irrigation to air conditioning that makes living in Houston possible, man is the one life form that can reason and create (the image of G-d – Maimonides) ways to change conditions to insure his survival. If climate changes, humans will adapt because that’s what humans do. And if we don’t we will disappear because we couldn’t. That’s evolution. Which is why I am left to wonder why those who most insist that evolution must be accepted are the least willing to accept its consequences? So back to the idea that is now being floated about that we should genetically engineer humans to adapt quicker to a changing climate. Eventually the climate will change back with now genetically altered humans having to re-adapt back or I supposed re-engineer back to the way we were? Evolution and scientific advance has given us the ability to do something, but we are so busy asking if we can do it, we aren’t asking if we should do it. In any case, the Haber-Bosch process has allowed humanity to adapt the Earth to feed far more people than it otherwise could. The physical realities of food production are that CO2 increases plant growth. So what if attempts to curb CO2 are designed not to cool the planet, but rather to stop population growth? Even if we could cool the planet, which is a huge question of ability, that would mean less food produced. *If you want to know why South America is aligned the way it is today, you should read up on the Nitrate Wars. It is fascinating stuff and it’s why Chile has been stable economically while Peru and Bolivia have always been boom and bust economies (they lost the war). Posted on November 18, 2016, in 14th Amendment, Books & Authors, Constitution, Dave's Knees, Global Warming, Hager, History, It's Science!, Science, US Navy, USS Michiagn, WWI and tagged Climate Change, Dave's Knees, Global Warming, Haber-Bosch Process, Internment Camps, Iran, Iran Deal, Jahi McMasters, Kanye West, Korematsu, Life and Death, Malthus, Navy, Submarines, USS Michigan. Bookmark the permalink. 1 Comment. Are the podcast still happening? Yse to be a link that accompanied the blog. It has been sometime since I have last seen the seen a podcast link. I miss the podcast, would listen to them while driving or while working. If the are gone, no biggey, if they are returning. I patiently await their return.